For over two decades, Detective Ray Truman has been searching for the killer, or killers, who have terrorized Portvale. Headless corpses, their bodies mutilated and posed, have been turning up all over the industrial district near the docks. Young female prostitutes had been the killer’s victims of choice, but now other districts are reporting the gruesome discovery of decapitated bodies. It seems the killer has expanded his territory as more ‘nice girls’ feel the wrath of his terrible rage. Meet the Cunninghams... A family bound by evil and the blood they have spilled. The large lodging-house they live in and operate on Artaud Avenue reeks of death, and the sins that remain trapped beneath the floorboards. Ray Truman’s search for a killer leads him to the Cunningham’s house of horrors. What he finds there will ultimately lead him to regret ever meeting Caleb Cunningham and the deviant family that spawned him. The hunter becomes the hunted, as Truman digs deeper into the abyss that is the horrifying mind of the most dangerous psychopath he has ever met. Blood Related is a psychological roller-coaster. I couldn’t put it down. The nature or nurture theme comes across strongly. Reflective of Caleb and Charlie Cunningham's disturbing family background and the outcome of what could be only described as twisted parenting. Parents (Ella and Vera’s) poison continues to bleed into the adult lives of two brothers. The madness of their crimes is chilling, and persistence of Ray Truman whose goal is to bring them to Justice - leads the story into an endless horror fest for the reader. The Cunningham’s childhood home becomes a house of horrors. 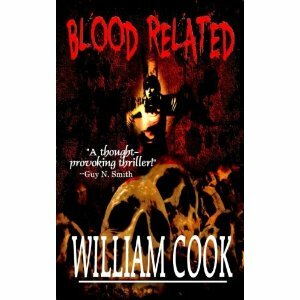 Spine chilling gore and the insight into the mind of a serial killer kept me hooked. In my mind’s eye I could imagine the carnage, sense the emotions, with that feeling of watching a horror movie at every twist and turn, I wanted to look away, but couldn't. 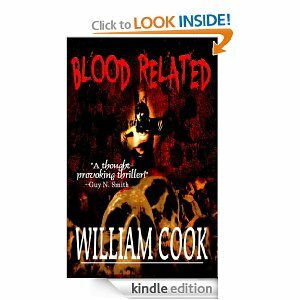 William Cook has a talent of making the story come to life. And if this is your choice of genre, then you are in for a treat. My publisher and I need your help . . .